In between responsibilities (fleeting nanoseconds, really), including coordinating an advocacy campaign at work and still unpacking from the move (yes, we’re still unpacking) I’ve been brooding about this year’s Piolet d’Or. I look forward to learning about the nominees and who they choose to honor every year. But this time, not only did I disagree with their choice, the recipients probably don’t feel as honored. I wouldn’t. I’ll fill you in more in a moment, but there was some positive news that I’d like to tell you about first, especially if you’re as into the possibilities of climbing mountains in Alaska as I am. After several false starts from Talkeetna, Talkeetna Air Taxi pilot Paul Roderick found the weather window that would allow them to land in the midst of the Revelation Mountains, a sub-range of the greater Alaska Range, approximately 80 miles west of Talkeetna. After spending two nights on the mountain, they rated the route up to WI5. The final leg included a signature Alaskan traverse with plenty of knife-edge exposure leading to the summit. The Revelations have only recently started to be explored. In the 1960s, author and alpinist David Roberts lead the first expedition there. Roberts named most of the mountains himself, including Apocalypse Peak, which he described as “fearsome” in On the Ridge Between Life and Death. Congratulations to Clint and Jason, and a special thanks to Clint for being generous in allowing me access to his photos. 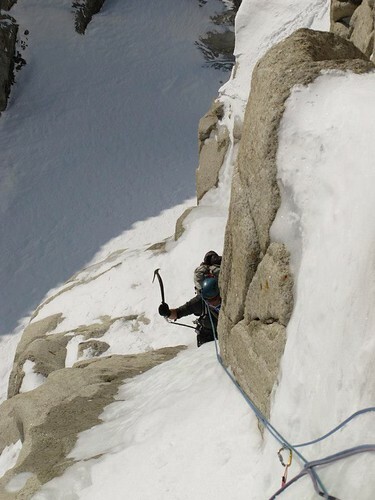 A French ascent of Kamet (7,756 m.) in India. A British climb of the so-called Prow of Shiva (6,142 m.) in India. A Russian team that climbed light, except an enormous food-stuffed haul bag to traverse iconic Muztagh Tower (7,284 m.) in the Karakoram. 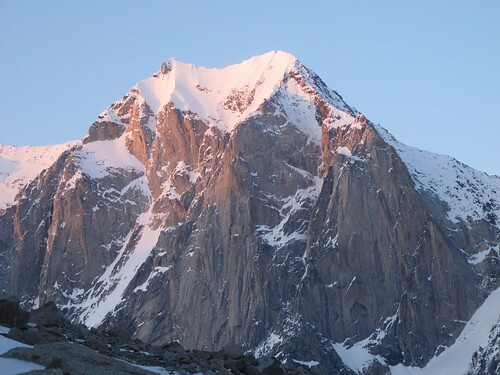 An American team that tackled the southern features of Baintha Brakk (7,285 m. and a.k.a. The Ogre). A committing six-day Japanese ascent of the south pillar of Kyashar (6,770 m.) in Nepal. It’s hard to disagree with the jury in that each climb is worthy of note. In fact, just reading up on the alpinists from these ascents is thoroughly fascinating. But sharing the honor of the title of 2013 Piolet d’Or winner devalues the competition. I celebrate alpinism and climbing in general on this blog and I do so through my personal perspective; it’s subjective (though I insist it’s more often correct than incorrect). What I choose to feature — like Helander’s new climb — is about as much matter of taste as it is about respect. I select certain climbs and climbers to honor here. Why I choose one over another is up to me, and if people knew my rubric for making these pages I might get criticized. Still, I make decisions and I usually stick by them. If I were working with Stephen Venables and rest of the 2013 jury, I would have advocated for the Mazeno Ridge traverse to be given the award outright. Of the ascents, it was the largest in scope, in length and elevation. So congratulations Sandy Allan and Rick Allen: You win my Piolet d’Cuivre. On a side note, I’ve been in touch with the Michael’s sister, Suzanne, about some of his work outside of climbing. People in our circles usually only remember Michael for being a charming, yet badass climber. He was also a gifted researcher and writer. He walked a line of the Suburban Mountaineering life like few contemporaries.